It is beginning to feel like spring which to me, means lots of fresh strawberries. I seem to eat them daily during this time of year. One of my favorite more treats is a berry kale smoothie. 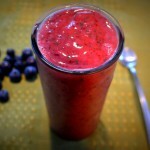 It is just as easy to jump out of bed blend together a smoothie as it is to brew a cup of coffee. This has been my regular go-to smoothie. It has kale in it. But, you can’t taste it. It blends up nicely and just adds a bit of texture. I once read that the kale acts as a little scrubber in your intestine to get all of the gunk out of the cracks and crevices. For some reason, I like that idea that the kale is really cleaning out my insides. I have been making it for the kids and they are drinking it. I don’t try to hide the fact that there are veggies in here–and they get a kick out of drinking a kale smoothie–that tastes wonderful. 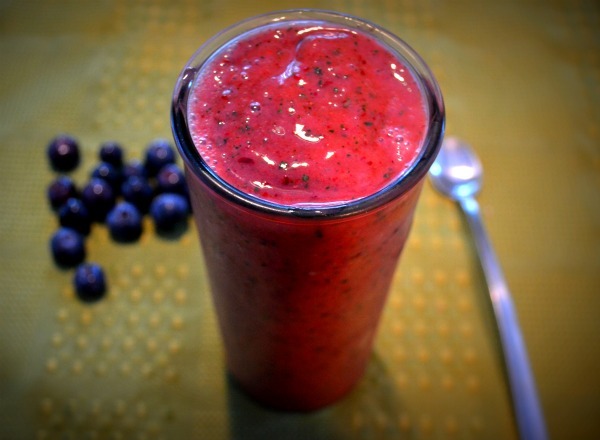 Super healthy smoothie that is quick and easy to make. Add all ingredients to a blender and blend until smooth. If your blender is having a tough time, add a little more water or almond milk. Give it a taste and add a bit of agave nectar if you feel it needs a bit more sweetness.